"Nations that require more vaccine doses tend to have higher infant mortality rates [IMR]. The US childhood immunization schedule requires 26 vaccine doses for infants aged less than 1 year – the most in the world – yet 33 [out of 34] nations have better IMRs." A vaccine study posted on the website of the NIH (U.S. National Institutes of Health) under the National Library of Medicine shows a strong correlation across the 34 countries evaluated between the number of vaccines given to infants and the rate of infant deaths, or in scientific lingo "infant mortality rate" [IMR]. The abstract, conclusion and two key graphs from this study are posted below. Common sense would tell us that an infant's immune system is not well developed and that the 26 vaccines scheduled for infants by the age of one year in the U.S. could easily overtax the coping mechanisms of many infants. Now the data from this study confirms that those countries which give only 12 to 14 vaccines to infants have much lower infant death rates (by as much as 50% or more) than the U.S. and other countries with higher numbers of vaccinations. Remember that huge pharmaceuticals which focus on maximizing shareholder value above all else make billions of dollars on these vaccines. They do everything they can to hide information like this to protect their huge profits. Dozens of major media articles have shown the serious dangers of vaccines, yet the media largely parrots the views of its largest advertisers, including big pharma. Educate yourself and don't fall for all of the media and government hype. By being well informed and taking action, we can protect the health of our children and future generations. Note: Why are those who have vaccinated their children so upset by those who haven't? If their children are vaccinated and the vaccines are effective, there should be nothing to worry about. The infant mortality rate (IMR) is one of the most important indicators of the socio-economic well-being and public health conditions of a country. The US childhood immunization schedule specifies 26 vaccine doses for infants aged less than 1 year – the most in the world – yet 33 [out of 34] nations have lower IMRs. Using linear regression, the immunization schedules of these 34 nations were examined and a correlation coefficient of r = 0.70 (p < 0.0001) was found between IMRs and the number of vaccine doses routinely given to infants. Nations were also grouped into five different vaccine dose ranges: 12-14, 15-17, 18-20, 21-23, and 24-26. The mean IMRs of all nations within each group were then calculated. 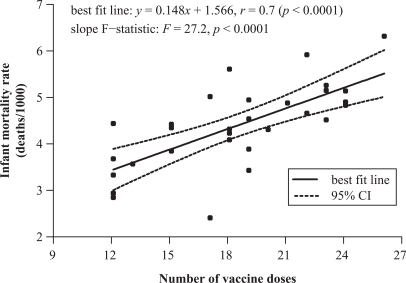 Linear regression analysis of unweighted mean IMRs showed a high statistically significant correlation between increasing number of vaccine doses and increasing infant mortality rates, with r = 0.992 (p = 0.0009). Using the Tukey-Kramer test, statistically significant differences in mean IMRs were found between nations giving 12-14 vaccine doses and those giving 21-23, and 24-26 doses. A closer inspection of correlations between vaccine doses, biochemical or synergistic toxicity, and IMRs is essential. Compare the infant death rates in the left column above with the number of vaccines given to infants listed in the right row. The graph below shows the strong overall correlation with few exceptions. The US childhood immunization schedule requires 26 vaccine doses for infants aged less than 1 year, the most in the world, yet 33 [out of 34] nations have better IMRs. Using linear regression, the immunization schedules of these 34 nations were examined and a correlation coefficient of 0.70 (p < 0.0001) was found between IMRs and the number of vaccine doses routinely given to infants. 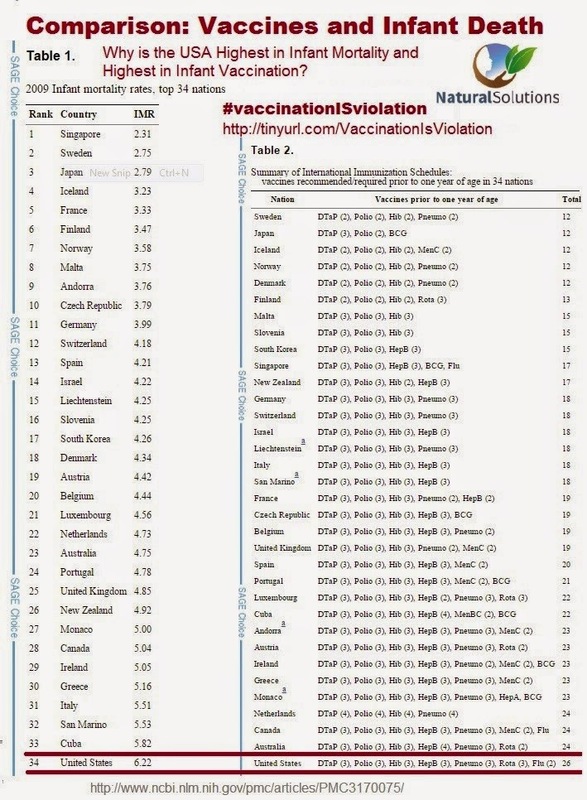 When nations were grouped into five different vaccine dose ranges (12-14, 15-17, 18-20, 21-23, and 24-26), 98.3% of the total variance in IMR was explained by the unweighted linear regression model. These findings demonstrate a counter-intuitive relationship: nations that require more vaccine doses tend to have higher infant mortality rates. Efforts to reduce the relatively high US IMR have been elusive. Finding ways to lower preterm birth rates should be a high priority. However, preventing premature births is just a partial solution to reduce infant deaths. A closer inspection of correlations between vaccine doses, biochemical or synergistic toxicity, and IMRs, is essential. All nations – rich and poor, advanced and developing – have an obligation to determine whether their immunization schedules are achieving their desired goals. Note: See all charts and read the full study on this webpage of the website of the U.S. National Institute of Health's National Library of Medicine. The study was published in Sept. of 2011. 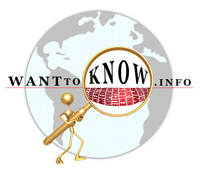 Contact your media and political representatives to inform them of the vital information on this study showing a link between infant deaths and vaccines. Urge them to study and bring publicity to this important topic. Invite them to read this article and explore the links included. Read excerpts from dozens of major media articles revealing the serious risks of vaccines. Spread the news on this study showing a link between infant deaths and vaccines to your friends and colleagues, and bookmark this article on key social networking websites using the "Share" icon on this page, so that we can fill the role at which the major media is sadly failing. Together, we can make a difference.